An innovative outreach project by the University of Ulster to promote STEM subjects (Science Technology Engineering and Maths) to secondary schools has helped pupils from Cookstown High School think ‘outside the box’ to come up with a novel solution to recycling. Around 80 Year 11 and 12 pupils from 10 different schools across Northern Ireland took part in the University’s first ever WiCADET camp (Widening Access through Computing Apps Development Training.During the 10 week ‘app camp’, teams each had to design a new market ready computer app. 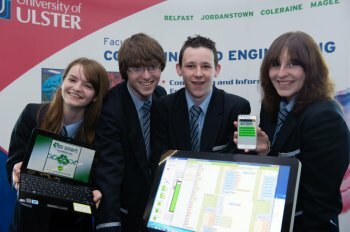 Cookstown High School’s team, ‘Outside the Box’, made up of team members Daniel Brown, Joel Glendinning, Anona Weir and Rachel Woodward and their mentor, Jennifer Gillespie, came up trumps with their recycling app, ‘Eco Smart’ to lift the coveted App Camp 2012 top prize award. Their award winning app ‘Eco Smart’ has already generated interest among local councils keen to promote recycling.PhD student, Jennifer Gillespie, who mentored the winning Outside the Box team,explains that the aim of the app was to create greater awareness among the general public about the importance of recycling. “We did some initial research to get a better understanding as to why some people do not recycle and took this into account when developing the app. Runner up spot was filled by CRENovations from Cross and Passion College, Ballycastle and their Lifestyle Organiser app. Team members were Catheir Brogan, Eimhear Fitzpatrick, Rory Magee and Niamh Nevin and they were mentored by Kyle Davidson and Stuart McKee. Lifestyle organiser allows the user to manage everyday tasks by creating simple ‘to do’ lists to be managed and categorised to suit the individual. Ballymoney High School, mentored by Stuart Henry, came third with their Rock and Roll app. The team members, Aaron Brown, Shannon McAllister, William Parkhill and Chloe Stewart, created a fun and interactive game to help users understand the dynamics of physics. Dr Black said she hoped that by engaging with and challenging the pupils in a university setting, the app camp would encourage them to consider higher education and raise awareness, particularly among girls, of computing as a relevant career option. She added that this need for more computing graduates was backed up by the App Camp 2012 judges: Charlie Tuxworth (Equiniti-ICS), Therese Charles and Debbie Rankin (Silver Fish),Luke McNeice and David Hughes (Kainos) andJerry Staple (Origin Partners). Dr Black said they hoped to build of the success of the App Camp and run the project again next year. Other members of the University project team involved in the app camp included lecturing staff Dr Joan Condell, Mr Derek Woods, Mrs Mairin Nicell, Dr Adrian Moore and Mrs Janet Allison.The WiCadet camp is funded by Ulster’s outreach programme. Eco Smart at the Universty of Ulster's 'App Camp'.